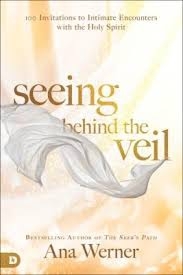 Seeing Behind the Veil: 100 Invitations to Intimate Encounte | Karmal Books online Christian books and media store. In this unique and supernatural devotional, seer, prophet, and missionary, Ana Werner shares inspiration that she personally received through prophetic encounters, angelic visitations, supernatural visions, and revelatory experiences in Heaven. These daily entries come from Heaven's perspective--the very thing you need as you are going through the highs and lows of everyday life.